Welcome to the first ever Free Header by Alvin Corneal. It is a monthly section in which former national team member and coach Alvin Corneal will contribute. For most of you Alvin Corneal is name that you have known for a long time. Alvin joins Trinidad and Tobago Football Online to provide his views on the game. Trinidad and Tobago did not make it to the World Cup finals in France 98, a statement of fact which as correct in 1994 before the USA 94 finals, and the Italia 90 finals. Ask a Trini the reason for his country's failure to progress to that level, you can write a book on the reasons which will be offered. 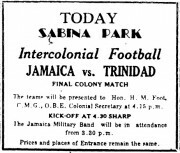 On this occasion Jamaica, the fiercest competitors of T&T for Caribbean supremacy has actually qualified and the floodgate has opened for new reasons. What has Jamaica done that Trinidad and Tobago did not? A foreign coach! that is the exclamation or maybe the explanation. Its funny that the business of a foreign coach has been tried without success in Trinidad since the mid fifties. Those who are old enough will remember the former England player Jimmy Hill having a stint which lasted six months. His knowledge may have been sound, but the ultimate results of our national team in those days never elevated past our neighbouring islands. Americo Brunner, a Hungarian who was domiciled in South America during the early sixties, was employed for a year, just after Frank Brennan, another British had failed to make a positive impact on the game in the Calypso country. He would like to have claimed the credit for the emergence of Warren Archibald, Leroy DeLeon, etc. But that credit had already gone to the Surinamese born August Wooter, a super defender in his day and a very charismatic coach who cast a positive soccer spell on the young St. Benedict team of the era. To go through the English contingent of Michael Laing, Kevin Verity, the Brasilian Casa Grande, the Dutchman Jan Zwarthuis, the German Joachem Figge and the Yugoslavian Vranes Zoran would bore you to death, especially as the results have all been the same. This was not to say that these coaches were not knowledgeable. On the contrary, the opposite was true. They were good intelligent coaches who worked hard to take the quality of our game upwards. It did not work. However, it succeeded in leaving a deep lack of respect for local coaches, who were not paid the exorbitant salaries the foreigners received, and who the local administrators believed knew little about the game. Strangely enough, it was a local coach, Bertille St. Clair, who eventually took the country's youth team to the Finals in Portugal in 1991. This marginal success should have rung a bell in the heads of the hierarchy, but instead, St. Clair was relieved of his duties and the players who gained very valuable experience from the Portugal jaunt, were not retained as a unit for the future. A great opportunity to qualify for the Italia 90 finals showed up when Mexico was suspended for using an overage player in a youth tournament, Guatemala had a money dispute with their top players and they refused to play and all that was needed was for T&T to gain ascendency over USA, Costa Rica, and El Salvador. After a theatrical presentation by the local media and the Association and two months of verbal hype, the team was faced with the simple situation of either defeating or tying USA in Port of Spain and its off to Italy. They faltered. Today, the mystery continues and no one can understand why a country with so many outstanding players over the past forty years cannot qualify for a World Cup finals. In my next article I will try to give you my humble opinion as to what is necessary for the next step to be achieved.